Philadelphia Is Ending A Major Contract With ICE Philadelphia is terminating a long-running contract with federal immigration officials that critics say has been used by agents to target unauthorized immigrants for arrest. Philadelphia is ending a controversial data-sharing contract with Immigration and Customs Enforcement. In recent weeks, protesters have gathered at City Hall to call for the reunification of families separated by the Trump administration's zero-tolerance policy and the abolition of ICE. 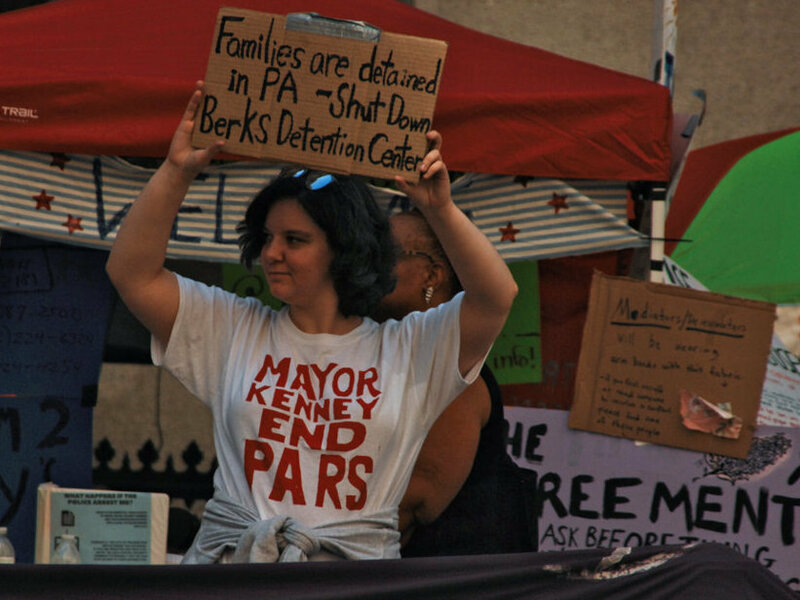 For weeks, so-called "Occupy ICE" demonstrators have shown their fury by encamping outside of Philadelphia City Hall, erecting a large tent village of sorts and hanging signs demanding that ICE be blocked from having access to the database known by local police and court officials as PARS. Now Kenney, who has been a outspoken defender of Philadelphia's status as a sanctuary city, is saying no more. "If I could abolish ICE, I would," the mayor said. "But we can abolish this contract, and we are." Through the system, where police log all the interactions they have with city residents, ICE can access a person's full name, birth country and detention status. Not listed is whether someone is in the country legally or not. Kenney, however, accuses federal agents of doing guesswork to racially profile city residents. "Just because the person's name is Lopez, or some other Hispanic name, you're going to go to their house and take people out of their home? I mean, It just makes no sense," Kenney said. "And I never want to be part of this." 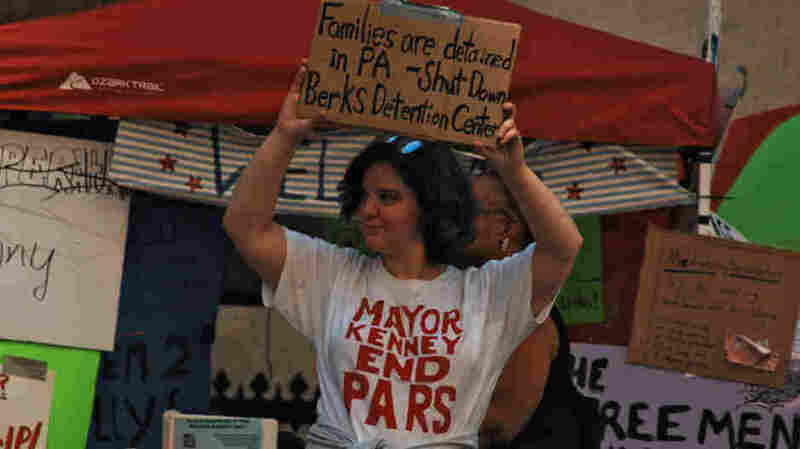 Federal immigration enforcement officials are not pleased, describing the decision as the latest barb from Philadelphia's leaders to immigration enforcement officials, who have been facing off over migrant rights since President Trump came into office. An ICE spokesman noted in a statement that Philadelphia's sanctuary city status already makes enforcing the country's immigration laws challenging. The ICE spokesman said blocking agents from using the database "adds insult to injury by needlessly compromising public safety." Across the country, protesters are agitating for both local governments and private companies to break ties with ICE in response to President Trump's "zero tolerance" approach to immigration enforcement, which led to the now-rescinded policy of separating families caught crossing the border. Activists on college campuses from Maryland to California have launched campaigns for universities to end contracts with ICE. So too have employees at private companies, including at Microsoft, where employees recently gave the company's chief executive a petition demanding that a software contract with ICE be axed. "The immigrant advocate groups are clearly winning significant battles at the local level, and this is counted now among them," said Peter Spiro, who teaches immigration law at Temple University, referring to the victory for immigration rights activists in Philadelphia. "Immigrant advocates have nowhere to go in Washington these days, in either with the administration or in Congress," he said. "So they're trying to exercise these other pressure points." Back at the encampment, activist Mara Henao, 29, who was born in Colombia and helped organize the anti-ICE encampment, said since President Trump's hardline policy on immigration started escalating, life for many of her family members and friends has become distressing. She said blocking ICE's access to the database can alleviate some of their worry. "It's important because all we want to do is to be able to have a normal life," she said. "We talk about this. Like, what if someday, they come for you, Mara, what are we going to do?" she said. "Do we send the kids to my mom? It's all these things. Why am I have to worry about it?" Department of Homeland Security officials told NPR that immigration officials will "continue to work to remove illegal aliens and uphold public safety" in Philadelphia. They called the decision to not renew the database contract "irresponsible." "That's not the policing that we're looking for. There's rules and regulations that police have to follow that these guys don't follow," the mayor said, referring to ICE. "So we're not going to provide them with additional information so they can round up people."